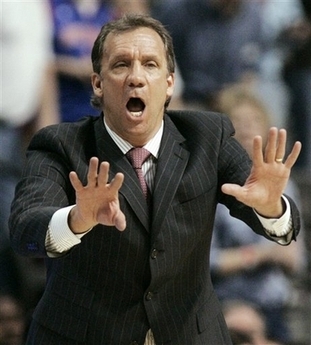 Flip Saunders led the Detroit Pistons the the Eastern Conference finals three straight years. That’s why they fired him. Flip Saunders was fired as the Pistons’ coach Tuesday, four days after Detroit was eliminated from the playoffs by the Boston Celtics. And more changes could be on the way for a team bounced from three straight conference finals. Saunders had a year left on a four-year deal he signed in 2005. His ouster comes three years after he took over for Larry Brown, who led the Pistons to two straight NBA finals. Bizarre. I don’t have the knowledge of the game to judge whether Saunders get the most out of the talent at hand. But, certainly, the Boston Celtics, to whom the Pistons lost in the finals, were widely considered the most talented team in the NBA. This strikes me as a knee-jerk move.